If we don't catch it on Friday night we make sure we DVR it and watch it during the weekend. I must say Chris Hansen is my personal fav. Yes he is attractive, but that voice of his. Wow he pulls me in every time. He could be narrating a school text book on computer coding and I would think it was interesting. This week he did an episode on Day Cares. And who is really watching your child. I still can not shake this episode. I think every parent who has a child in day car should watch this episode. DO NOT TRUST YOUR STATE TO DO THE HOMEWORK FOR YOU. Battery, Domestic Battery, Aggravated Assault and even MANSLAUGHTER. DUI, Possession of Drugs, Fleeing & Eluding, Resisting Arrest With Violence, Driving While License Suspended, etc. Why are these people watching your children? Understandably people have a past, learn and move forward from those mistakes only to make themselves better from their mistake. However, I personally feel that if you have EVER, EVER, EVER, have had a violent criminal past then you should not be allowed to run or work in a day care facility. No, ifs, ands or buts about it. Mr. Hansen also disclosed that 1 in 5 offenders, re offend. is YOUR State not doing anything about this? It's almost as if they are aiding these criminals/felons to strike again. The State makes "exceptions" for people, they want to give them a second chance. But in the mean time, your child might not have a chance in their care. Your State should not allow offenders and felons to be licenced or work near children. They should be doing NATIONAL checks on them. They should run annual checks (if not monthly) on their providers. Not one every 5 years. You know how many people slip through the cracks but doing a search every 5 years. A lot can happen in 5 years, especially if you are a "bad" guy. on speaking with Mr. Hansen and she simply said that, yes, yes, there are providers out there with criminal pasts, and it may not be right but in order to try and shut down a provider a child has to either be seriously harmed or die. How shocking and gross is that?! One would think that the STATE would do their best efforts to keep the innocent children away from "bad" people and to protect the children of the future. In essence they are handing innocent, weak children in the care of felons, to test them, to see if they will re offend. The State needs to get ride of some of these ridiciously programs and actually put the time and money into an issue that really needs to be addressed. The safety of our children. I am going to start talking to people in my State's capitol about this. Please tell me your thoughts on this. I for one want to protect my child and will do whatever I can to do this. 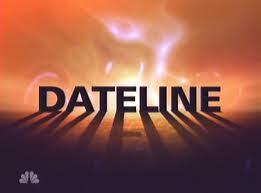 go to the Dateline website and watch some short clips. You can also go here to get read some great Q&A from Mr. Hansen. I was seriously on edge this morning when I had to do the drop off. I wanted to be like, "Ummm excuse me, do you do criminal background checks on the employees?" I figured I would probably be the 10th person of the morning asking that question so I better not! Haha! Luckily, our daycare has an open door policy and video cameras in all the rooms. But, it still makes you wonder! 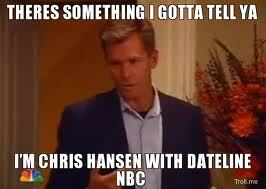 I'm a big Chris Hansen fan too - I love how he busts people! I've seen lots of people posting and talking about this episode. It makes me so glad that I had a private nanny as a kid! My sister is in the process of starting an at home licensed day care center and they just finished their background checks. They had to do a check on anyone who lives (even her step daughter - who is 11 and is there only on weekends) in the house. While I'm sure there are people out there who shouldn't be watching your kids - I feel a lot more confident in licensed facilities after watching her go through this. We're in NY and it's pretty darn strict. Not all states are like that!!! I am the director of an early learning center and we do background checks on EVERYONE even volunteers! I do have to say that state licensing requirements are sad - they are the lowest regulations you need to operate. That's why in every single state they have a Quality Insurance and Rating System. It is completely voluntary. Those that participate have to meet so many criteria (similar to accreditation) to receive a rating. Ratings are from 1 to 4 in most states. Even an ONE is great because that person went above and beyond the basic licensing regulations. Seriously scary. I'm sure some states are better than others, but thanks for helping to bring attention to this!! How about you check ALL your sources before posting things about people that are posted on here's FULL past!! WOW! I had no idea but that is scary! Thanks for posting!